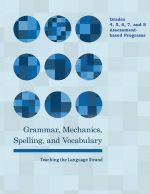 As a teacher, I am reminded ad nauseam to “teach the Common Core State Standards.” Since I am a reading specialist, hiding inside the Trojan horse of English-language Arts in an underperforming middle school, I quietly administer reading, spelling, grammar, usage, and mechanics assessments to my students. It won’t come as much of a surprise to most of you that the diagnostic data indicate that some students have severe reading and spelling deficits. Here then is the crux of the issue. The underlying pre-suppositions, results, and practice of standards-based instruction can be diametrically opposed to assessment-based instruction, according to the diagnostic needs of our children. This is especially true in the field of reading instruction. The underlying pre-suppositions of the standards-based movement accept a priori that education is solely a behavioral science. We critics of this assumption would argue that much of teaching, learning, and parenting is culturally-bound and intuitive. In other words, some of effective teaching is truly an art form. We critics are not above using the scientific method and learning theory to debunk the behavioral purists. For example, the standards-based-movement begs the vital question regarding its linear scope and sequence of grade level standards: Do we really learn that way? 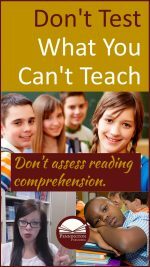 Many teachers in my fields of English-language Arts and reading would argue the contrary. In fact, anyone who has taught the basic parts of speech to sophomores in high school won’t be surprised to learn that excellent teachers from elementary school-to middle school-to last year’s freshman class taught the same parts of speech. In other words, some learning may be recursive, not linear. Teachers, students, and parents are the critical variables here. The Common Core writers recognize this recursive element and have included the Progressive Skills Review within the Language Strand to address this instructional issue. As is frequently the case in education, an idea takes on a life of its own in practice. A conversation a few years back with a fellow English teacher was instructive, but chilling. 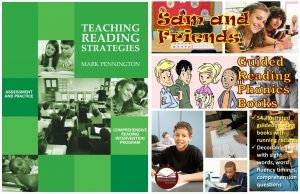 In discussing the results of our informal reading assessments, he looked over the clearly demonstrated reading deficits in his testing data and then said, “I teach the grade level standards. I’m not paid to go back and teach everything that the students don’t know.” He accepted a job as an administrator in our district the next year. Now, I am not over-critical of administrators… They are held accountable to implement standards-based instruction and to increase the all-important state and/or district standards-based test scores. However, administrators have got to do better than the principal who refused to implement reading intervention programs at her under-performing school because “The elementary teachers are supposed to teach reading; that’s their job, not ours. 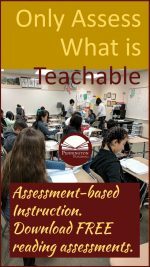 We teach the middle school Common Core State Standards here.” Of course, the principal certainly needs to read the appendices of the Common Core Standards which recognize the need for assessment-based instruction. It’s easy to whine at the devolution of academic freedom and the sorry state of education that has been relegated to a series of standards-based grade level scope and sequence charts, with benchmarks or task analyses tacked on to provide the pretense of specificity. It’s harder to offer solutions, but here are a few thoughts. True educators need to teach both Standards and children. 1. Do teach the grade level Common Core State Standards. Really. However, control the time allotted to teaching these standards and insist on your academic freedom here. When challenged as to why you are teaching a lesson or skill that is not explicitly listed as a grade level Standard, cite previous or advanced grade level standards that address your remedial or advanced grade level instruction. 2. Patiently argue that some students need to “catch up, to keep up.” Justify concurrent remediation or acceleration and grade level instruction by citing diagnostic data. Let data plead your case. For example, if instructed not to teach to diagnosed deficits, ask the principal/district supervisor to write a letter to the parents of students to alleviate you of this responsibility, against your informed judgment. They won’t, but they won’t bother you for awhile. 3. Explain that that any criticism is not about really about what you teach, but rather about how you teach. You are scaffolding instruction, according to the demonstrated diagnostic needs of your students in order to teach the grade level standards. That’s why assessment-based instruction is so critical. You are making the standards comprehensible and in order to do so, you must differentiate instruction. How you teach is a matter of academic freedom.